In the summer of 1876 in San Francisco, the people are gripped by two terrible plagues. The first, a terrible heatwave, has tempers and temperatures rising. The second- small pox- is much more deadly. In Chinatown, Blanche Beunon and her lover Arthur Deneve live in blissful ignorance in a boarding house Blanche has bought with money she has earned from dancing at the House of Mirrors, a bordello catering to expensive tastes. Blanche, Arthur and Arthurs bosom friend Ernest are all former circus performers from a famous travelling show in Paris, but they have emigrated to America, Arthur having sustained an injury to his back which prevents him from working. Blanche is happy to support the men; she loves her job and she loves her man. Everything is perfect. And then, the cross-dressing frog catcher, Jenny Bonnet knocks Blanche over in the street one day. Jenny is the kind of woman who attracts the wrong kind of attention. She is frequently in and out of the lock up for dressing in men's clothing, and she carries a Colt pistol in her trouser pocket. She rides a penny farthing about the streets of San Francisco, and asks altogether too many questions. Like: Why doesn't Blanche know what type of farm it is her son is being raised on? So when someone kills Jenny in cold blood, Blanche blames herself. After all, it's an association with Jenny that has changed Blanche's world forever. 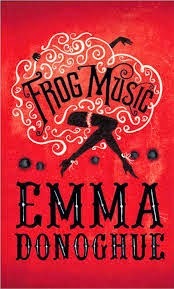 Frog Music is a fascinating novel, based on real historical events which is sometimes slow to move along. The main character, Blanche Beunon, has a tendency to get weighed down with internal monologue, and while her realisations do further the plot along, this massive book reads better in it's action based scenes. While Donaghue's commitment to historical research is certainly applaudable, one thing I know is that is is extremely difficult to get the balance between accuracy and pace perfect. In this case, the book comes just shy of the mark. The thing I loved about this book, however, was its characterisation. Each and every figure, from the main cast to the supporting figures, were living, breathing things. I could hear their voices, picture them walking, and never questioned an action because they all seemed perfectly on track with what I knew of them. In particular, the characters of Jenny and of Ernest were enticing, original, and had fully formed character arcs of their own which enhanced, without taking away from, the plot. I would have loved to have seen a little more of Jenny's back story come into the plot... Blanche only just begins to scratch the surface of her dead friend's past by the end of the story, but in itself, this is excellent characterisation, as Blanche suffers from a massive case of solipsism. I couldn't help but draw comparisons between this Blanche and another, that of Tennessee Williams' Streetcar named Desire. As a non-French speaker, it did slightly irk me to have to flick to the back of the book every time I needed a translation. However, having the characters speak in French added to the flavour and authenticity of the novel. Perhaps if the translations were placed as footnotes they would not have interfered so much with the flow of the text. This is a salacious (really, at times it's quite saucy), intriguing, genre-bending novel which will surprise those who loved Room in it's total departure from Donaghue's previous work. While it didn't quite thrill me, I still had to keep reading to the end, and I almost didn't guess the killer, so that definitely counts for something. I give Frog Music three stars.